Of all the bikes unveiled last year, one pair of Husqvarna concepts had us throwing our wallets at our computing machine screens. Husky heard the dull thumping of leather smacking against glass and is ready to deliver. The 401 twins have gotten the green light. Hells. Yes. 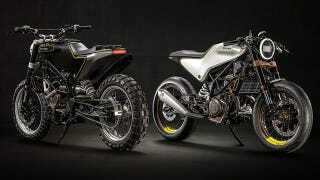 There was never any doubt that Husqvarna was going to build the Vit Pilen cafe racer and Svart Pilen scrambler. They're both based on the Duke 390, which we're finally getting in the U.S. this year. And with a platform to build on, a renaissance at Husky, and a reborn bike market champing at the bit for something light, quick, and customizable, the 401s were practically a lock. But now we have confirmation. I can tell you that they will as 2017 model year. They may not look the same, a concept is after all a design assignment dream while a finished model must follow the laws and rules, but they will definitely have the same style. That's good enough for us, and as we noted at the time, it wouldn't take much to make the 401s production ready with some reworked bodywork and a license plate holder. 2017 can't come soon enough.